Between the release of Android Lollipop, a slew of new cutting-edge handsets, and a brand new platform for smartwatches and wearables, 2014 was an exciting year for Android users. New hardware and operating system updates aside, the Google Play Store had its share of awesome new titles as well. Between innovative new keyboard apps, new calendars and productivity tools, you’d be hard pressed to choose the best. We’ve picked out our favorite new Android apps of the year. Check out our list, below, to see which apps made our cut. 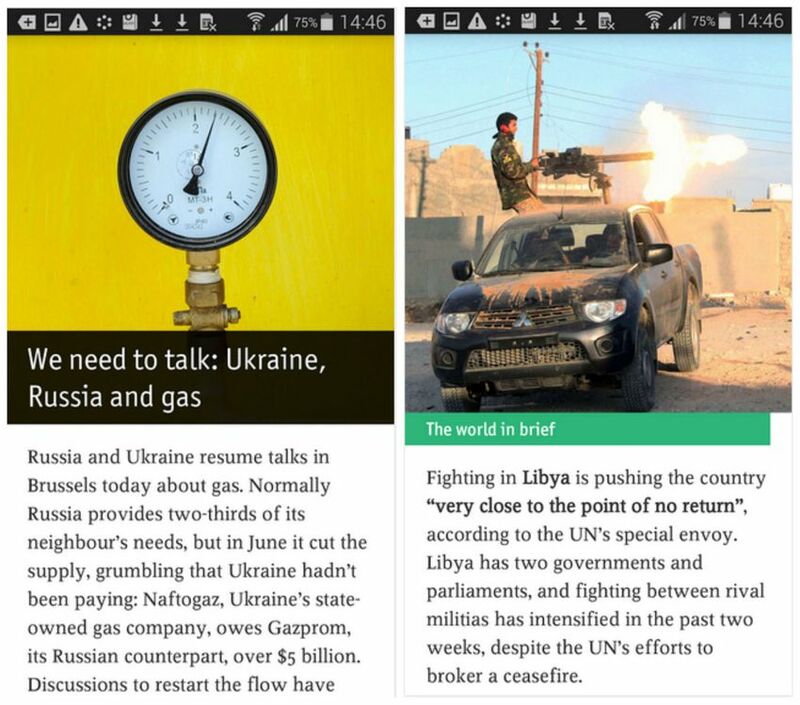 Meanwhile, iPhone users can check out our roundup of best iPhone apps of 2014. 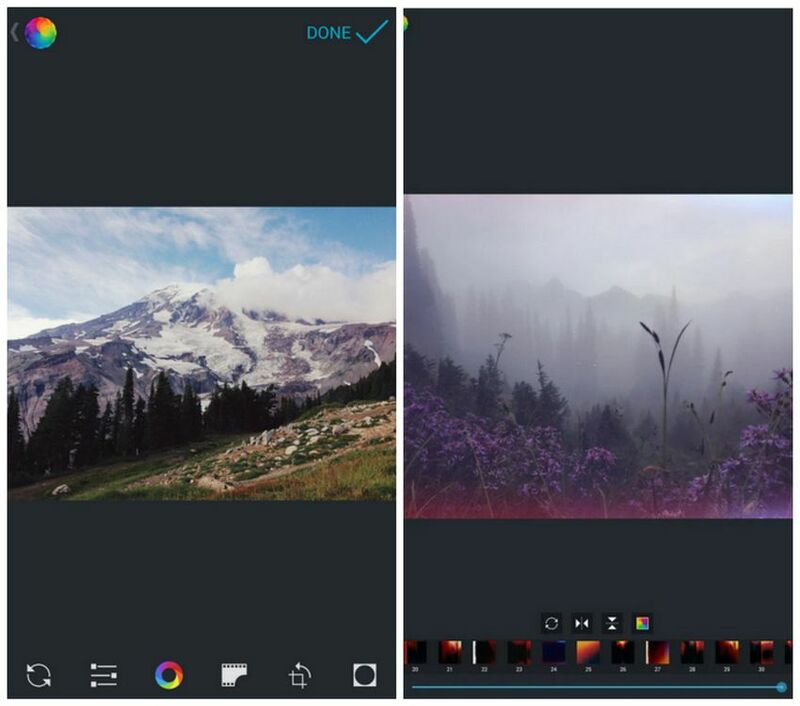 We loved Afterlight on iOS, so we were excited to see this powerful photo editing app make it to the Google Play Store as well. Afterlight makes it easy to make quick on-the-fly adjustments like cropping, rotating or adding borders to images; it also comes with dozens of much more powerful tools for tweaking your pics. The app boasts nearly five dozen filters and dozens more textures that give photos that real film look, along with special effects that can make your photos really stand out. 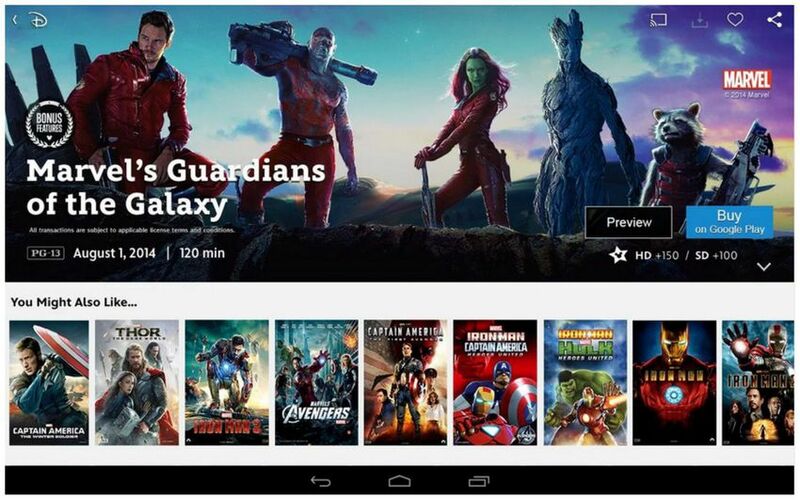 The result of a partnership between Google and Disney, Disney Movies Anywhere lets users watch any Disney, Pixar or Marvel movie from an Android device at any time, regardless of whether you’ve purchased the movie from iTunes, Google Play, or Vudu. The app also provides exclusive video content such as original shows, sneak peeks at upcoming films and behind-the-scenes videos. Battery life is a precious resource, and it’s not always obvious which apps are hogging the most juice. That’s where Estar comes in. The battery management app provides curated recommendations of the most power-efficient apps in Google Play, but its real power is in its analysis of apps you’ve already installed. 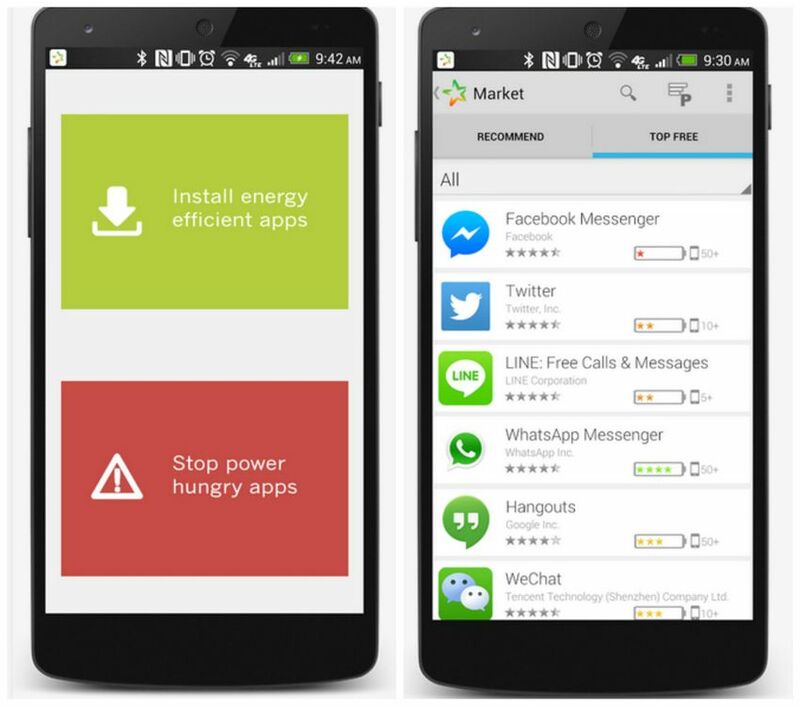 Estar will not only tell you which of your apps are the most power hungry, but also provide estimates of just how many minutes of battery life you’ll save by killing each app — and recommending better alternatives. While there are many great Google Calendar clients, sometimes nothing can beat a native app. 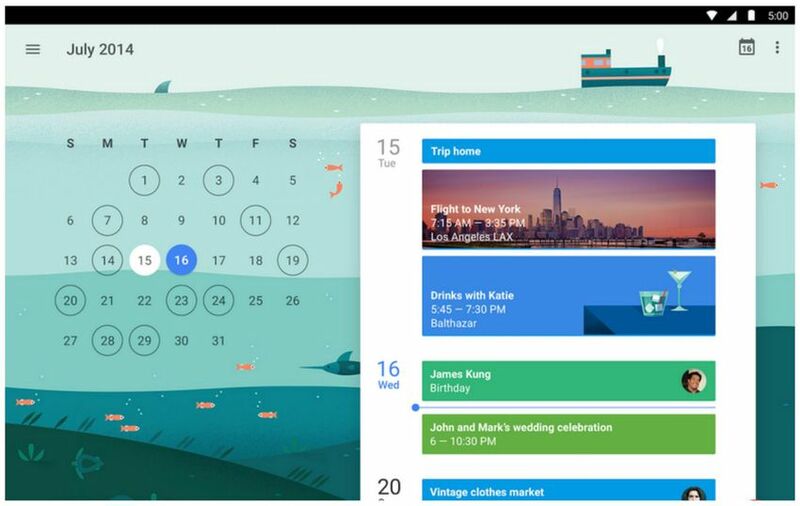 Google’s new Calendar app is a welcome addition for those who rely on Google accounts for emails and appointments (though it also syncs with other calendars on your phone, such as Exchange). Google Calendar automatically pulls in emails from your connected Gmail accounts to relevant calendar events. If you have a flight confirmation in your Gmail inbox, for example, the app automatically adds the flight to your calendar, and will surface real-time updates on your flight status in your calendar. If you love the look of pure Android unadulterated by the carriers, but don’t have a Nexus device, the Google Now Lancher can help bridge the gap for those of us stuck using manufacturer’s awful skins (I’m looking at you, TouchWhiz). 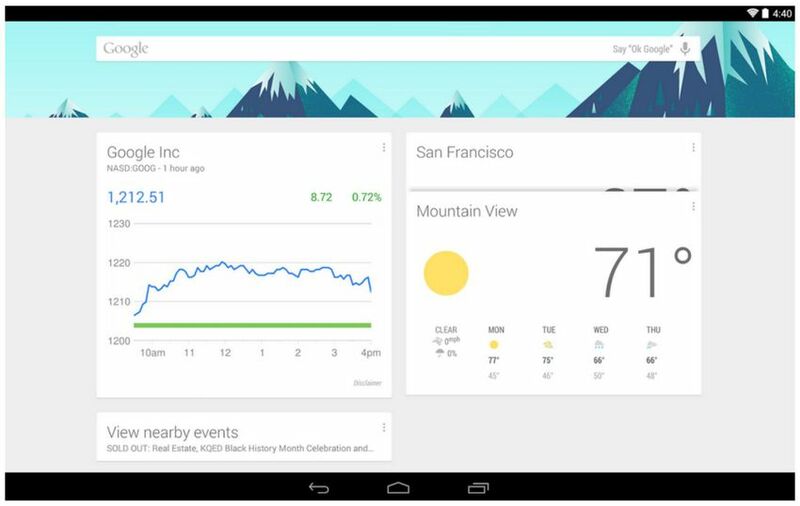 The Google Now Launcher not only give your home screen a visual overhaul, it puts Google Now right at your fingertips — allowing you to initiate searches, text messages and other actions with the “OK Google” voice command. 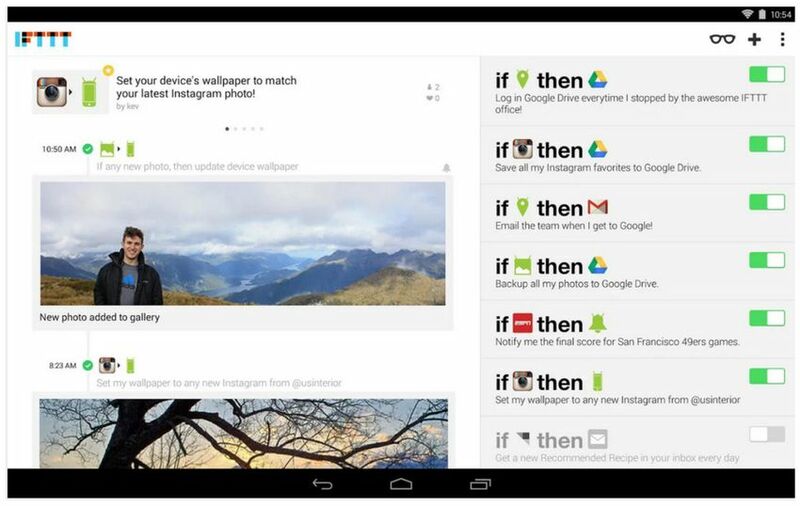 IFTTT finally brought its Internet automation magic to Android users this year, with a new app for creating its famous “if this, then that” recipes. More importantly, the Android app comes with a variety of new recipes not available to the app’s iOS users. 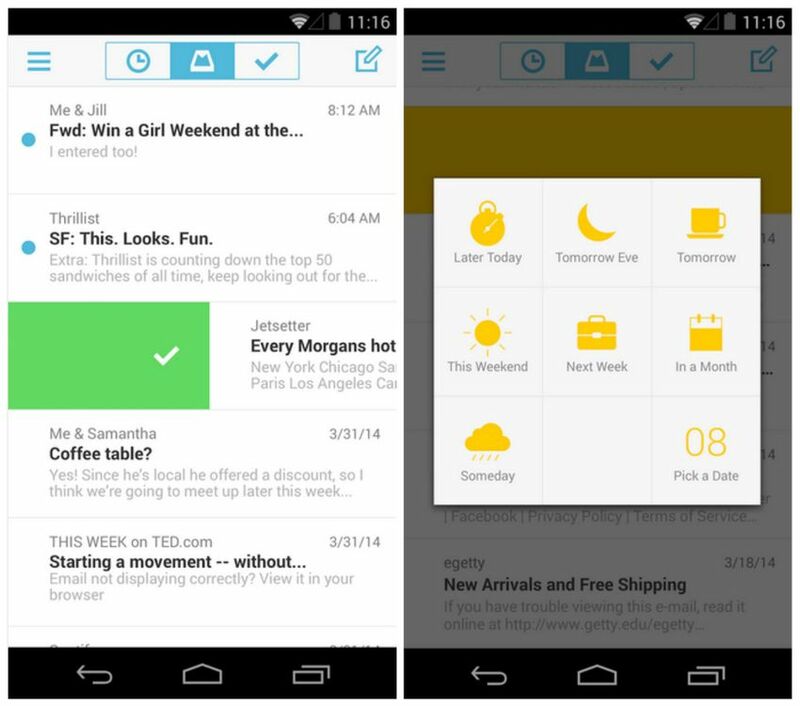 The Mailbox app, now owned by Dropbox, is among the best email clients out there — particularly if you subscribe to the “inbox zero” philosophy. The app’s gesture-based system allows you to quickly sift through emails with a series of swipes, so you can finally stop relying on the “mark as unread” button. Mailbox also debuted with the platform’s new auto-swipe feature, which learns from your previous actions to predict what you want to do with emails as you get them, such as archiving daily deals emails or always deleting social media notifications. 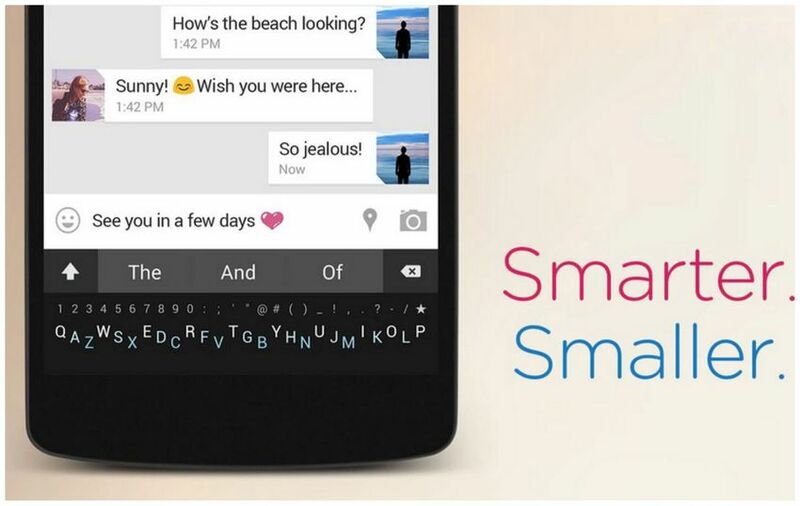 Minuum sets itself apart from other keyboard apps with its uniquely tiny keyboard. It’s meant to enable fast yet accurate typing. By shrinking the keyboard down to its smallest possible size, the thinking goes, users are able to maximize precious screen real estate — and do one-handed typing even on larger-screen devices. Tiny keys are also uniquely suited to wearables, and the app also launched on Android Wear, Google Glass and Will.i.am’s Puls smart cuff. 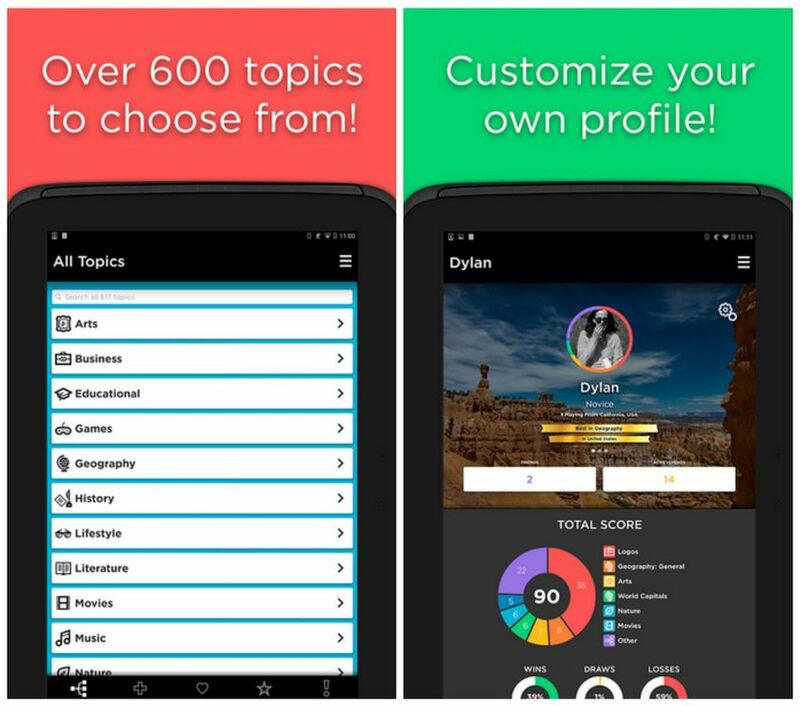 Social trivia game QuizUp lets users go head-to-head in quizzes that test their knowledge of specific subjects. The app pits players against other users around the world as they compete in real-time matches. QuizUp has thousands of quizzes based around hundreds of topics both broad (geography, history, games) and niche (K-pop factoids, anyone?). The more you compete, the more you can climb the app’s leaderboards. Sunrise has long been one of the most popular candor apps on iOS; now Android users can take advantage of its organizational superpowers. 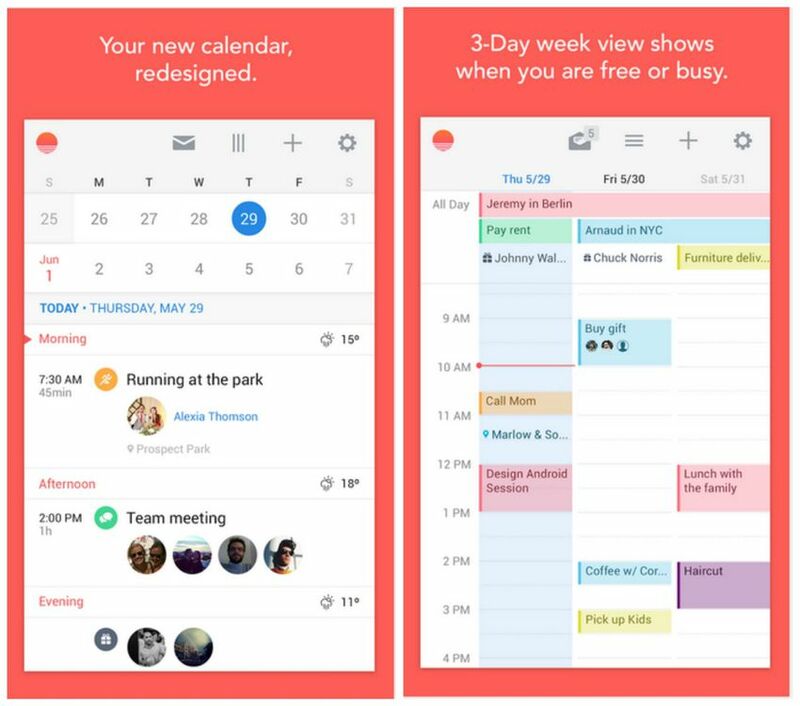 Also available on desktop, the smart calendar supports Google, Exchange, Outlook, iCloud, Trello and Todoist accounts — so all your appointments and daily tasks will always be in one place. The app integrates location information from Google Maps to automatically add maps to events, while the handy Android widget ensures your schedule is always on your home screen. One of the best sources for #throwbackThursday material, Timehop allows you to look back on what you were doing on any given day in years past. 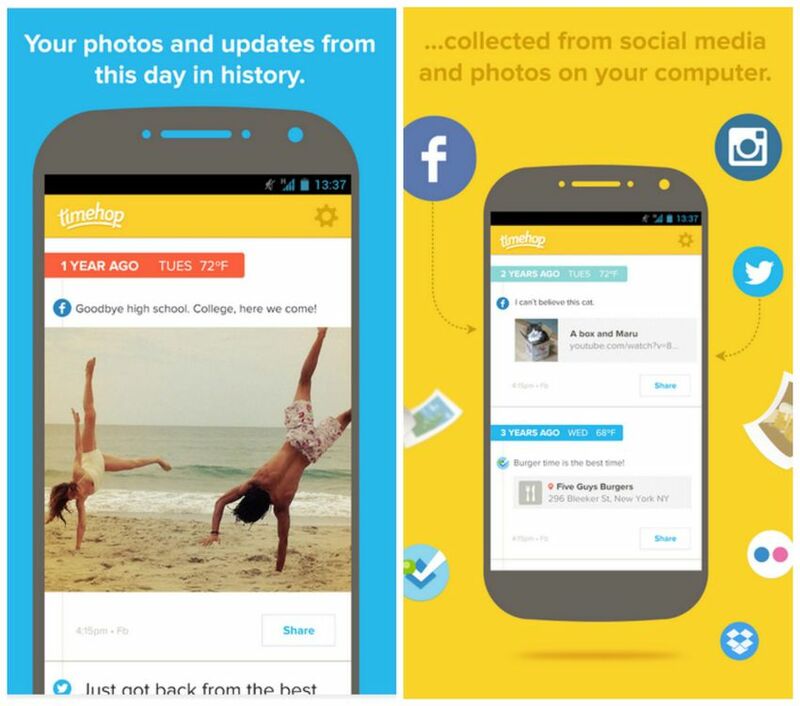 The app connects with your social media accounts— Facebook, Instagram, Foursquare and Twitter — to surface posts from years past each day. In other words, this is automatic life logging without any more effort than your normal social media activity. Sometimes you want bite-sized nuggets of news that you can easily get through on the way to and from work. The Economist Espresso accomplishes just that with a morning digest highlighting some of the best stories from the Economist each Monday through Friday. The curated selections are meant to give an overview of the most important business, political, and financial news stories of the day that are easy to get through. Subscribers get unlimited access to all of the stories each day; non-subscribers can access one article a day for free. This entry was tagged android, android users, apps and software, google+, social media, tech. Bookmark the permalink.